Dhanam, the most celebrated business magazine has published its 15th July 2014 issue. The most interesting features of this issue are articles like 'Will Modi's moves be successful', 'Online term plans - 10 tips' and 'Motivate continuously for leadership excellence'. In addition to this, a number of thought provoking articles find place in the current issue. The lead story about Modi's plans to modify India gives an insight to the readers on the innovative measures taken by the current government in giving a new face to the nation. An interesting article on leadership 'You can be the leader of the current age' is highly motivating. An in depth story of P K Warrier, the chief physician and managing trusty of Kottakkal Arya Vaidhyasala.Complete news reports on the Dhanam Business Summit and Award Nite is another attraction. 'Online term plans - 10 tips', an article on selecting suitable plans keep the readers engaging. An insightful story on S. Shyamala, the head of traco cable enable the readers to know her real life. Equity funds which could gather more profit is yet another interesting article. The highlight of the issue is a deeply covered story on Varun Chandran, a person who rose to the position of 'Corporate 360', a startup company which is running successfully in Singapore. Truly unveiling his life, 32 year old Varun who started his career as a football player, fortunately landed in the world of computer which changed his life forever. Being one of the most circulated business and investment periodical in malayalam, 'Dhanam' extensively covering business news around the globe which is widely read by corporate managers, political leaders, decision makers and economic thinkers. With a core team of young professionals, Dhanam has also contributed much in the policy decision making of the government. Having a circulation of more than 1 lakh copies and a commanding readership of 5 lakhs, Dhanam has established its supremacy among the economic thinkers in Kerala. Dhanam which comes with an affordable price tag is recommended for those who wish to make their business more success. 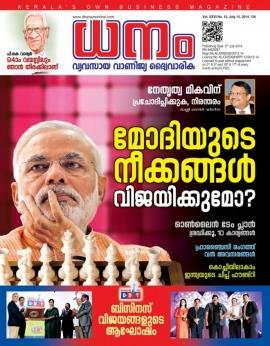 Dhanam malayalam business magazine is one of the most circulated business and investment periodical in malayalam. Being the most comprehensive business magazine which extensively covering business news around the globe is widely read by corporate managers, political leaders, decision makers and economic thinkers. With a core team of youngsters, Dhanam has contributed much in the policy decision making of the government.